I had this Breitling Navitimer’92 on a blue monday. Admitted, a stainless steel / gold combination with a blue leather shark strap wasn’t probably the best choice I had made in a long time. After a week I flipped it (and advertizing with that type of watch is good for a few anecdotes itself) for another watch. Although I was pretty sure I was very Navitimer-ish, this ’92 model in gold/steel didn’t do the trick. 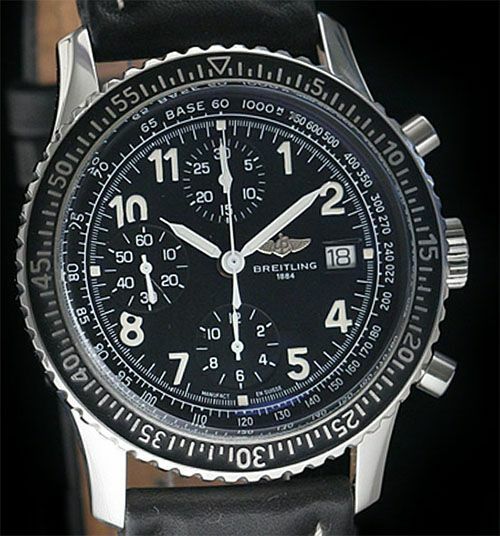 Should have gotten the regular Old Navitimer or the vintage ref.806 model instead. Chances are big I still would have it in my collection. 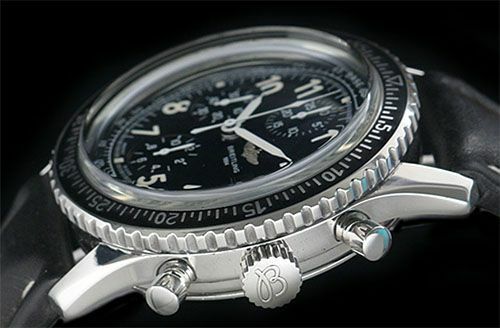 Long gone but not forgotten is a Navitimer ancestor, the Breitling Aviastar. This watch was only in production from late 1996 till 1998 and actually a 1990s successor of the early 1940s ref. 765 Breitling chronographs. I had the pleasure of seeing a few in the flesh about 10 years ago and immediately loved the slim chronograph case, bezel with raised markers and dial with several ‘steps’ in it. The typical Valjoux 7750 is less cool than the tri-compax lay-out in my opinion, where the sub-registers are located on the 3, 9 and 6 o’clock positions. However, this lay-out is only one of the few downsides I could come up with. In the year of the introduction of this timepiece, the price was set to just over 2300 USD. The Breitling caliber 13 used in the Aviastar is based on the ETA/Valjoux 7750 movement, nothing special so far. Just a decent automatic chronograph movement with an annoying one directional winding system causing the watch to wobble on your wrist as soon as the rotors find its free direction 🙂 Some people like this ‘feature’ though. This Aviastar was available in black, brown and blue. The brown version would be fashionable again today. I don’t have much going on for the typical blue Breitling color though. So either black or brown. This uncommon and especially underrated Breitling of the late 1990s, would be one of my favourite Breitling models actually. The Old Navitimer would be one of the few watches I would pick from the current catalogue, and believe it or not, the quartz models with digital displays such as the Aerospace and Emergency would be an option as well. As long as the price would be right. Chrono24 tells me that these neo-vintage Aviastar beauties should fetch around 1980 – 2500 Euro these days. Aviastar watches have a very decent size for today’s standards, a 41.5mm case diameter and about 16mm in height. The Breitling caliber 13 / Valjoux movement delivers a power reserve of approximately 42 hours. Good thing about this caliber is that they are probably fairly easy / cheap to maintain throughout the years. Pictures courtesy of Ed Loebl, WatchSeller. Watch is not for sale any more.